The market for vegan businesses is booming! With the spread of veganism from the UK to Germany, Israel, the US and beyond, there is a strong market for new vegan products, services and innovations worldwide. The companies below specialize in consulting and PR work for vegan organizations, companies, authors and so on. Although their physical base may be in Canada or the UK, most are comfortable working with clients worldwide. All the best of luck on your new vegan business! A special thanks to M. Butterflies Katz for posting: “140 vegan businesses around the world.“ Much of the information for this post was gleaned, with permission, from her blog. All of the companies and links below are provided as resources and are not intended as endorsements. If you know of a vegan marketing, consulting or PR firm not listed here let us know. Evolotus Public Relations agency has been owned and operated, since 2006, by vegan animal rights activists: Gary Smith and Kezia Jauron. The Vegan Punk is an established UK vegan and animal rights blog, now offering ethical SEO and digital marketing services for ethical businesses. After auditing your site I make a variety of technical adjustments to improve its structure and performance. I work to improve and optimise your existing content, further boosting your website’s visibility in the search results for relevant key phrases. I write and market quality content to get your website seen and linked to by the right people – using ethical ‘white hat’ strategies to attract potential new customers to your site as well as pushing it higher in the search results. I can plan and manage your social media accounts, posting tailored updates to help build an audience and encourage engagement with your brand. 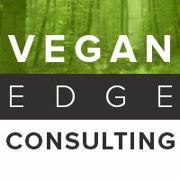 Vegan Edge Consulting is a full service Business Development and Marketing agency working exclusively with vegan businesses and entrepreneurs. They offer Strategy and Planning, Branding and Marketing, Web Development and Graphic Design services. Owner, Simon Allard, is a business coach and marketing strategist by profession and has been running his own consulting company since 1999. Simon explains “However, because I am passionate about my veganism (my whole family is strictly vegan, too) I have newly set up ‘Vegan Edge Consulting’ as a separate business to EXCLUSIVELY help vegan businesses and entrepreneurs. This means I can now combine my years of business and marketing experience with my ethical lifestyle choices to help other vegans in their business pursuits.” They also run several other Vegan Facebook pages: Vegan Business Guide, Toronto Vegan Guide. Become A Vegan, and Vegan Maven. Is Berlin The New Vegan Mecca?